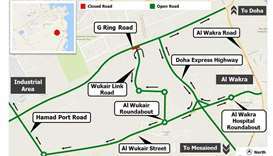 The Public Works Authority will implement a two-day closure on one direction of Ali bin Abi Talib Street in the direction from D-Ring Road to C-Ring Road, while keeping the opposite side of the road open to traffic. 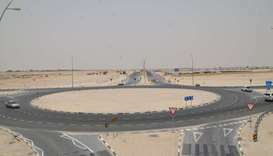 The closure, implemented in co-ordination with the General Directorate of Traffic, starts at midnight Friday and lasts until 5am on Sunday, to enable laying the asphalt wearing course. 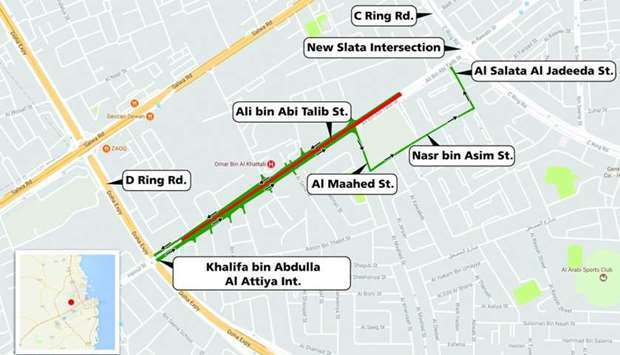 The closure extends from about 100m after Khalifa bin Abdulla al-Attiya Intersection to about 200m before New Slata Intersection on C-Ring Road. 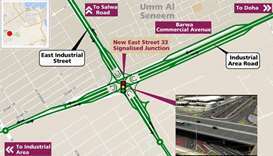 The service road, parallel to the main road will be the alternative route during this period, and to reach New Slata Intersection, road users will have to turn right onto Al Maahed Street then left onto Nasr bin Asim Street, followed by another left turn onto Al Salata Al Jadeeda Street towards Ali bin Abi Talib Street, as shown in the attached map. 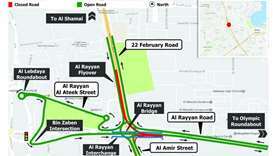 Ashghal has apologised for any inconvenience caused by this temporary closure, and requested road users to abide by traffic signs and follow the diversion signs to ensure safety on the road.